Named for its gently curving waves of gold, the Wave Collection incorporates a contemporary style with the classic motif of gemstone fashion jewelry. Each piece features graceful rows of 18k yellow, rose, or white gold, surrounding brilliant-cut round diamonds to create an organic and timeless look that is comfortable for any occasion or none at all. 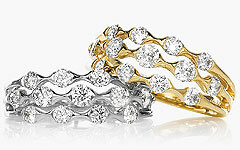 Available in a variety of necklaces, rings, bracelets, and earrings, with diamonds or gemstones.